The fourth Running of the Bulls of this year’s Sanfermines featured bulls from the Predraza de Yeltes bull-ranch and they ran a fast clean run all the way to the entrance to the bull ring where one of the bulls gored two runners – and one of the runners is in a serious condition. Today’s Running of the Bulls was complicated by the fact that the course was jam-packed with runners all along the whole stretch. There were several dangerous moments as lots of runners were slippng and tripping up amid all the pushing and shoving of the runners. The bulls knocked over several runners in Estafeta and in City Hall square but did not attempt to charge at them. One runner was seriously hurt when a bull knocked him over near the fencing at the corner of Mercaderes. However, none of the runners here were gored and just a few needed treatment for contusions and bruising. The pack came out of the pens in a tight group and ran up the slope of Santo Domingo at a very fast pace. There were lots of trip-ups and falls but the bulls did not charge at any runnersharee brown-colored bulls lead the way at this point as far as City Hall square and they knocked over some runners but did not attempt to gore them. At the Telefonica stretch and at the entrance to the bull ring there were lots of falls due to the huge number of runners. Inside the passageway leading to the arena, one of the bulls gored two runners. according to a statement issued by the infirmary inside the bull ring, one of the runnners was gored in the neck and is in a serious condition. He is being operated on at the moment in the infirmary. The other runner was gored in the arm pit and is in a stable condition. 1 running bulls. 2 goring. 3 traumatisms. The running of the bulls with the lowest number of wounded from bruises since 07/13/2015. 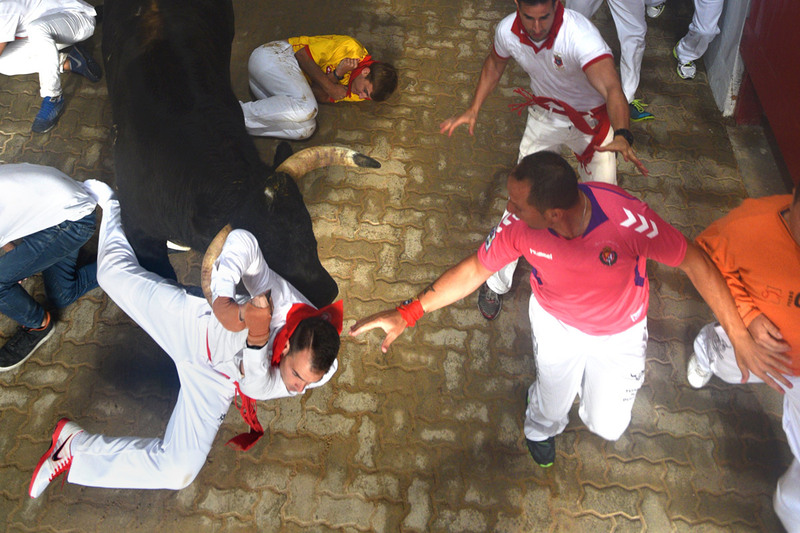 The 25th running of the bulls with the highest temperature (19ºC). The 1st was on 07/08/1982. The 7th time that there are 2 or more gorings in a running of the bulls held on Sunday. Callejón is the stretch with the most gorings. 64 (23,44% of total) since 1980. The 10th time that a goring took place on Callejon on Sunday. The previous took place on 07/14/2013.